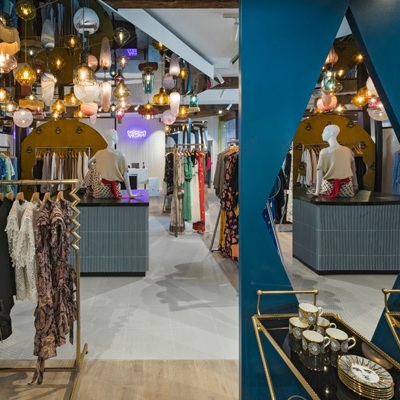 The Shop at Bluebird opened its unique store in Carriage Hall, in the heart of Covent Garden. The best fashion, beauty and homeware pieces from around the world are showcased in this amazing store. The atrium of the shop resembles a courtyard thanks to its stone tiles flooring, its glazed ceiling and many plants and flower spread all around. The vegetation refreshes the environment bringing to life an exotic atmosphere. Another important feature of this concept store is the large amount of mirrors implied in the design. The mirrors, together with simple geometries, have been used to create multiple optical illusions. There are areas that seem to disappear without leaving any trace, while other spaces that look like they are extending or appearing out of nowhere. At the first floor the reflections of dozen antique pendant create a magical atmosphere, together with the fragments of sky that can be seen in the upper part of the atrium thanks to a huge multifaceted mirror sculpture.